It will be interesting to see how Phanteks' Fibreglass holds up against Noctua's Sterrox, and how much of a boast 30mm gives. My only question is how much will this wunderkind of a HSF cost? Two NF-A12X25s and a redesigned HS with two more heatpipes. I wouldn't be surprised if it comes out at close to double the price of the NH-U12S. See the video on this page from HEXUS.net. Noctua are estimating the price as $100 US/€100 and availability as end of this year/early next year. Maybe in a month or two ill do a temp/niose comparison with the NF-A12x25, just not enough time when i reach home, back on road again. Thank you, Abula, for the infos. A ComputerBase review (in german) PC fan for radiators in the test: Arctic vs. be quiet!, Nanoxia, Noiseblocker, and Noctua. One of the Noctua fans compared is the NF-A12x25. 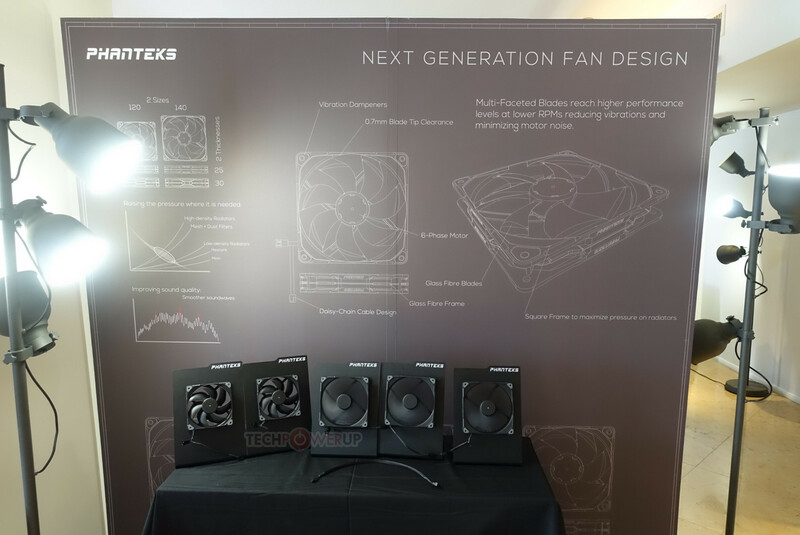 Apart from the Arctic F12, all the other fans were free of subjectively noticeable noise at low revolutions. Another day, another NF-A12x25 review or in this case two reviews. The links are for the test results page. The first is from GreenTech_Reviews (Russian) and the second from Hardware Inside (German). I have a Mugen5 on the way home, im going to test on an open bench the stock glidestream on it, the NF-A12x25 and NF-P12 REDUX PWM, a Noiseblocker Eloop 120mm PWM PS, a Darkside 1850PWM, its kinda like a gentle typhoon but pwm, not sure if i still have an GT AP15 still (im almost sure i gave my last one to a friend that needed for a PSU, but i might have an 1150rpm). I'm seriously looking at mating a Kotetsu Mark II (which uses the same stock glidestream as the Mugen 5) with a NF-A12x25, so I'm looking forward to your results. I think there's a lot of that going around -- it shows how much of a hole the lack of SPCR testing has made. Noctua has released a LGA3647 version of the updated U12S featuring this fan in push-pull ($99.90 from Amazon). In other news, US sellers seem to have sold out of the PWM version of this fan at MSRP (a third party on Amazon is selling it, for the desperate, at $89.99). The ambient noise for this set of testing is 31 dBA, sounding like a silent basement. To measure noise levels that were softer, the Sound Pressure Level (SPL) was measured 10 cm from each fan. SPL was adjusted to 1 meter by subtracting 20 dB. The sound pressure meter is a Tenma 72-942. This sound level meter has a microphone which is not accurate under 30 dBA which is the limit of all but the most expensive SPL meters. At low levels sound measurement by extrapolation is not accurate, so that sound measurements are approximate. But the bottom line is that fans making a Sound Pressure Level less than 11 dBA cannot be measured. Optimum Tech Noctua vs Stock - NF-A12x25 Performance Review! Nice comparison of the range of Noctua fans. - DarkSide Gentle Typhoon 1850 PWM - I dont have Scythe GT anymore, this is almost the same just pwm. - be quiet! Silentwing3 PWM BL066 - I like them, just adding them to see how it does. - Noctua NF-P12 REDUX 1700 PWM (chroma rubber not included) - Similar to the old standard of SPCR NF-P12 (with the orange nexus that i don't have). - Noctua NF-A12x25 PWM - The new contender that ninjed the design of the GTs. - Noctua NF-F12 iPPC 3000 PWM - Bought it for a friend thats replacing the Antec CP850 fan, I didnt want to buy NF-F12 so this will do. Sadly i don't have anything remotely as good as Anechoic chamber, so im testing very late, but still my floor noise is too high for SPCR standards, and i dont have a high end testing mic (just a cheap db meter that goes till 30db), but i really wanted to test how the NF-A12x25 does on a CPU cooler compared to some decent fans in both noise and temperatures, for this the Mugen 5 was chosen, as its one of the most recommended 120mm CPU coolers and the mounting wires wrap to the front of the fan, this allows to mount any standard fan to it (while thermalright and noctua tie inside so some fan would not mount as easy). Either way, ill share my results when i finish. Not so much, first there was a party in the house up front that finish a 2am.... i couldn't start until that as the music while it was low it was still being picked by the db meter. Second problem, while the db meter is specked to 30db it never reached there, and it was very quiet between 2 and 4am, the lowest seems it measured was 36db. Third problem, placing at 1mt, the fan going below 800rpms it wasn't picking, it remained like nothing was changing, now being so quiet i could hear the differences between fans at low rpms. So i brought the db meter to 25cm from the fans, still here was difficult as 36.3db was the lowest it could reach and in most cases again was not perceiving much changes. What i really wanted to do was establish the rpms for 30db, 35db and 40db for each fan (i would have liked to also do 20db and 25db but i knew that the db meter was not capable from spec), once the rpms were established, i would simply run a stress test (between prime95 and blender) to see the temperatures and results, since the noise was normalized was simply to do to record the temperatures and stablish how was the fan temp vs db. So sadly i cant give you guys any meaningful info, i need a better microphone and a quieter place, as i said before the ambient noise of my home seems to be high for doing this test. With my original plan not happening, i still tested all 8 fans but this is more a subjective pov, so take my comments with a grain of salt. I still wanted to find if the NF-A12x25 was better than the rest, so i decided to a very simple test that i might do a followup later, i simply installed the fans, let it run on fanxpert3 and then swap them to manual control, drop them 50rpms at the time and hearing it from 25cm. - Phanteks PH-F120MP_BK_PWM - 700rpm, this was very wierd, below 1000rpms it behaves fine, but above that a scratching noise appears not sure if its the motor or the fan blades and gets unbearable above 1.5k. - Noiseblocker NB-eLoop B12-PS PWM - 750rpms, this aside from the noctua was the highest i couldn't hear, but it has a droning noise that appear very fast after. - DarkSide Gentle Typhoon 1850 PWM - 700rpms, this was more the bearing noise that was perceivable above that. - be quiet! Silentwing3 PWM BL066 - 700rpms, seem very similar to the rest, nothing that i found that special, at 1k rpms still remain somewhat quiet above that its very noticeable. - Scythe Kaze Flex 120 PWM SU1225FD12M-RHP - 650rpm, very decent fan, while it was hearable at 700rpms, it was not annyoing or loud, simply noticeble wosh, and for a free fan seems good enough. - Noctua NF-P12 REDUX 1700 PWM - 650rpms, i like the sonic signature of the fan, while i could still hear a wosh at 700rpms the sound it has at 1k is more tolerable than most. - Noctua NF-F12 iPPC 3000 PWM - 550rpms, this is the worst of all, above 1k rpms it has like motor noise very annoying, above 2k rpms goes balistic but really annoying its not the the air but the motor seems to produce a noise that gets worst as rpm increases. - Noctua NF-A12x25 PWM - 800rpms, i re did the test with a couple of fans after i did this, and still the same finding, its inaduble to me at 800rpms, take it with a grain of salt as i was sleepy but in my honest opinion its a very good fan overall, above 1k rpms it becomes noticeable, and taking it above 1.5k it becomes very loud, but at 800rpms it disappear from ambient for my hearing under my skewed conditions, a good 100rpms than any fan that i tested, now my question is weather this 100rpms nets any meaningful temperatures, but thats probably for another day. Either way, thanks for reading, ill try to see if i can get a better microphone and try to do the original plan sometime, for now i gotta go back to work. PS - I did found some weird behavior on FanXpert3, fans that couldn't be stopped on the CPU fan like the NF-P14, the Darkside and eloop now they could be stopped on the CPU_FAN header, also not always setting the idle rpms correctly in some fans like the NF-F12, was set at 1k rpms while he fan could be dropped to 400-500rpms. But i leave you the runs that were done yesterday in case someone is interested. I think you'd have to use the (other) review site cheat of placing the meter 10cm away from the source rather than 1 meter and get a 20dB SPL bump....that 10dB fan turns into a 30dB one. Of course, when your meter is 10cm away from a 12cm fan....you've got to wonder about where the ideal placement would be, near field vs far field sound, and that you still have a 36dB noise floor. Time to build that bunker! Yea i need a bunker, but i might try just for fun the 10cm, but i do think its not the house noise floor, i think its the meter itself having that limitation, im getting very close to yesterday measurements closing doors and windows, i still have a lot more noise on the outside but im getting very close to 36db. I did the 10cm test with 2 fans only (i dont have time atm to do all of them, but i might someday), i chose the NF-A12x25 PWM because of the thread and the included Scythe Kama Flex that comes on the Mugen5. I started on the Noctua @800 rpm, the db meter measure 36.7 to 36.9, to match this on the scythe i had to drop it to 500rpms (this drops is what FanXpert2 allows, in 50 increments is the minimum, and not always a number is fully match as you can see on the pics below, the noctua is more like 775rpms). To me the fan is much better, for the same noise, noctua is allowed to be ran 300rpms faster, and thus the temps of the CPU on prime95 are lower, this can be taken into lower rpms will net lower noise, so if it scales linearly it should be much quieter at 500rpms than the scythe (something that i can measure on my current room and will need a better mic), so takes for what its worth, and again with a grain of salt. One thing worth mentioning, is that one of the reasons i dislike Asus and its AI Suite is the CPU temperature, i cut it and place it near the HWmonitor for you guys to see, this has been always a thing of Asus and their implementation of an algorithm that predicts what they say "a more accurate temperature", but its not really linear or have fixed delta, sometimes is much lower and sometimes is higher, so at the end for me, this messes with how FanXpert will rule the fan curves and what you expect, and the main reason i favor MSI and AsRock over Asus. To me the fan is much better, for the same noise, noctua is allowed to be ran 300rpms faster, and thus the temps of the CPU on prime95 are lower, this can be taken into lower rpms will net lower noise, so if it scales linearly it should be much quieter at 500rpms than the scythe..
Good conclusion. Now start work on that bunker! Would love to also see a 140mm fan round-up from you sometime. Some bad news, i recently bought a Seasonic Focus Platinum 550W and while its a nice PSU and running it on hybrid mode bearly spin under load, the fan had a ticking noise that i didnt like, so with such a good experience on the NF-A12x25 PWM, i decided to replace the included fan with the FLX version as it has the same 2000rpm top max. The fan itself is great, same tonality and at 800rpms its very quiet, the problem is that it can drop that low, i tested multiple times with Asus FanXpert3 and the lowest i got it was 825rpms, then i decided to test it with Asrock and got it to around 800rpms (37% on bios fan control is the minimum, lower than that and the fan stops). The problem with the PSU is that the included fan starts very low, i tested on the same motherboard and the seasonic/Hong Hua fan starts at 18%, changing the fan was not that hard, but the problem is that since the fan needs a higher voltage to operate it doesn't start until a lot later, even pushing the hybrid button, with the stock fan it spins always, with the noctua doesnt start until load is applied... so overall not a good match, i feel the PSU will run a hotter because of this, and i don't think its a good idea on the longevity of the PSU. Personally i have moved away from 3pin fans, PWM its more flexible for multiple fan setups, but i gave it a shot to 3pin because of how the seasonic was design, sadly this fan isnt as good as PWM in terms of range of operation, the fan itself is just as good, its more the operational range. How would using three of these in the front of a Fractal R6 instead of two Be Quiet Silent Wings 3 140s compare?. Which would likely be able to push more air before it is audible at about a meter or a little more, and which would probably have a better sound profile at medium and high amounts of airflow? This review suggests that three NF-A12x25s perform better at both acoustics and cooling than two NH-A14s, although the testing methods aren't quite what I would hope, so it's hard to know exactly how to take them. How would using three of these in the front of a Fractal R6 instead of two Be Quiet Silent Wings 3 140s compare? I don’t have any personal experience with the be quiet fans, but I do have both A12x25 and A14 fans. I concur that A12 are inaudible at 800rpm, and the increase in noise to 1000rpm is minimal. The A14’s were audible to me at much lower rpm, somewhere in the 450-600rpm range. I’ve little doubt three a12 would move more air than two a14. Does anyone have experience with Noctua A12x15 fans, specifically relative to the A12x25? I’m in need of another two fans that’d I’d be running at low/no noise levels (so A12x25 at 800-1000rpm equivalent volume) and my while my current use-case can fit 25mm thick fans it’d be nice to have some slim fans for future configurations. The only review I’ve found comparing the two was here, and they seem pretty close but I’m always interested in personal experience. I do have both A12x25 and A14 fans. I concur that A12 are inaudible at 800rpm, and the increase in noise to 1000rpm is minimal. The A14’s were audible to me at much lower rpm, somewhere in the 450-600rpm range. I’ve little doubt three a12 would move more air than two a14. Thank you for sharing your experience, teodoro, it's good to hear confirmation that the 3 A12x25s are quieter when moving the same amount of air as the A14s. I'm just putting a system together from scratch, but I think I'm going to start off by trying the 3 12x25s. From the experience of other's which I've read, particularly Abula's, I take it that the BQ SW3 140s are quieter than the A14s, and have a better sound when they are audible, but my impression is that the margin might possibly be smaller than what's being reported by the by the 3 A12x25s vs 2 A14s, but it's just an impression and I could certainly be wrong. An additional factor for me is that I'm going to have a couple of HDD silencers in the front of the case which will get in the way of airflow from the front intake fans, so having 3 fans from the bottom to the top of the intake which perform well as both case fans and static pressure fans, while possibly being quieter, suggests that I should try the 3 A12x25s first. After I'm all set up, sometime down the road, I might get 2 SW3s and do some comparison tests. Last edited by anonapon on Fri Dec 21, 2018 12:51 pm, edited 1 time in total. On 140 i would get Bequiet Silentwings BL067, i dont like the NF-A14 (although recently i revisit the NF-A15 on NH-D15S and wasn't as bad, maybe its more the mesh of R4 that made them sound not pleasant to me). On 120 i would go with Noctua NF-A12x25 PWM, even over bequiet silentwings3 bl066, imo this is the best fan atm both tone and performance. Thank you for sharing your experience, teodoro, it's good to hear confirmation that the 3 A12x25s are quieter when moving the same amount of air as the A14s. If you want some benchmark, Overclockers did a comparison of the A12X25(w/ 120mm to 140mm adapter) with 140mm, and they also tested the SW3 140mm with the same reference fan than the previous test, so it's possible to compare the SW3 140mm with the A12X25. TLDR: At full speed(1000 RPM) the SW3 does 19dBa at free air, 24CFM through 30FPI Radiator and 59CFM unobstructed, the A12X25 at 1308 RPM does 16dBa at free air, 31CFM through 30FPI Radiator and 60CFM unobstructed.